The goal of any ad network is to connect two sides – advertisers that pay for getting new visitors and publishers that make money from showing ads in their websites or apps. It differs in each network, but some studies have concluded that around 30% of display ad traffic is fake or fraudulent. For advertisers it means 30% of their budget is wasted, and for ad networks – if they don’t fight it, they risk loosing advertisers because of bad ROI. As a founder of GetGamers – a gaming ad network, I have seen some ways, how this 30% of fake/fraudulent traffic is produced, and will share them in this post. Some publishers set up crappy, barely working websites and use bots like Jingling to send traffic there. One very active guy using this approach is Shalanka Anton De Mel from Srilanka – he signed up to GetGamers with replaystation.com, but he owns also gamegating.com, aliengamebox.com, top60games.com and many other gaming sites, in total: 26 domains. We requested access to his analytics, did not get it, and banned him. But there are more complicated cases as well – when a website has legitimate traffic and use bots as additional resource. 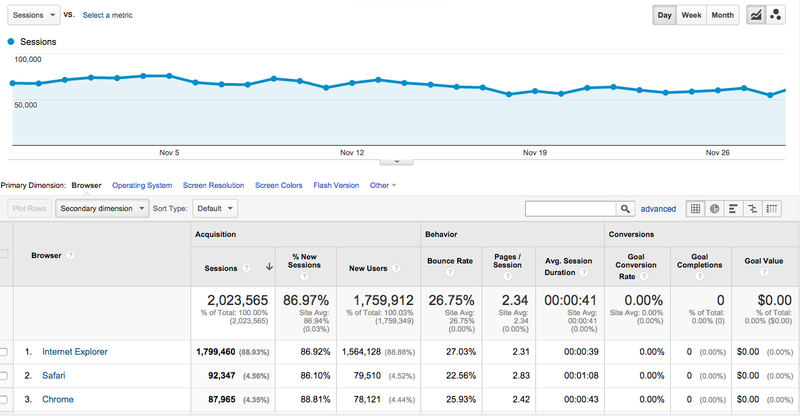 An example is jinzita.cc, where we got access to analytics. And from first sight in the main dashboard you cannot see anything suspicious – bounce rate is low, traffic seems stable with no high ups or downs.